Freelance graphic design doesn’t have a manual, but many new graphic designers have similar questions about this kind of work. Here are some of the most frequently asked questions about graphic design freelance. How do I earn enough as a freelance graphic designer? Earning “enough” is completely subjective and based off of your needs and wants. However, one way you can break this down is by creating a budget for yourself. Once you know how much you need to make, you can get an idea of how many hours you should be working and at what price. Accepting jobs below the price you want is often part of freelancing, which means you may work longer hours than you hope. However, applying for as many relevant jobs as you can will give you the best chance for earning enough money to survive. What resources are out there to find jobs? Most likely, yes. At least at first, graphic design will likely not make you enough money alone to support you. You may have to work one or two other jobs at first just to provide for yourself, and graphic design on the side. If you’re hoping to be a full-time freelance designer, I suggest saving as much money as you can now, so that making the transition is less of a risk. It is also important to note that you should be marketing yourself and actively taking freelance jobs before you make the switch, as it can be a long process to get your name out there. Is freelancing worth it, or should I try to join a graphic design company? This is entirely up to you and your personal situation. However, there are positives and negatives to both freelancing and working a steady 9-5. Freelancing is a good idea for people who have an unusual schedule or don’t adhere to a set schedule well. It is also good for those who want to have the authority to pick and choose which projects they work on. If you’re looking to brand yourself in a niche, freelancing is the way to do so. On the other hand, working for a company has many benefits, such as stable income and insurance benefits. You’ll likely also get paid time off, which is never the case as a freelancer. At the same time, working for a company means you’ll have to do what the company thinks is best, which may not always be what you think is best. You’ll also have a set schedule and may work in an office environment that is not as comfortable as working at home. However, you’ll have the support of others in the company, which can be a huge foundation for a new graphic artist. Graphic designers, like many people in the arts, are constantly questioned about how they can make a living in their field. With cutthroat competition, it can seem nearly impossible to live your dreams and make enough money. Today, I’m here to calm your fears and let you know that it is possible to make money as a graphic designer, as long as you follow some advice. Creating an identity for yourself in your field is necessary, whether you’re a graphic designer or not. However, it’s doubly as important when you’re a freelance artist because there is such fierce competition. Projecting yourself as an expert in one niche of graphic design is an excellent way to show that you’re the best at what you do. It may be tempting to take every job possible, but if you can afford to market yourself in one area and only accept relevant jobs, it will give the impression that you are concentrated on doing the best work in your area. If you create fonts, texture packs, or even website templates, you can make money licensing them out for years down the line. Build a store on your professional website where you can list every product you’ve created. Companies are constantly looking for fresh designs, so creating new graphic elements in your free time will pay off in the long run. Although it is important to earn your degree, it is also a good idea to create learning materials for the next generation of graphic designers. You can earn some hefty cash from writing textbooks about graphic design or teaching design classes locally or via the internet. Teachers may not make the best salary, but if you market yourself as enough of an expert (and have the experience to back it up), you can charge a decent amount of money. The plus is, if you’re teaching privately, you can factor in how much time it will take you to teach, including prep, and charge a reasonable amount. As an artist, it is important to continue to learn and hone your skills. There is always more you can learn. However, some of the most important skills to learn are not inherently artistic. Learning how to run a business, best marketing practices, and even a second language can give you a huge career boost. The more skills you bring to the table, the wider your audience becomes. A quick way to find other areas for learning is through Coursera, where you can earn certifications for completing college-level courses. These are documents you can show to prospective employers, which may help you land a job at a design company. Graphic design can be a challenging career, but the journey is worth the effort. Take the time to pursue these avenues, and you will see the work pay off in full. It may seem difficult to accomplish, but living your dream is possible. The Most Dangerous Writing App.com: Dare to Put Your Writing to The Test? Many people wish they could create art that’s awe-inspiring, captivating, and jaw-dropping. But, not everyone can conjure up such work. A huge part of why people aren’t “good” at making art is because people get over-the-top overwhelmed about looking at a blank page or canvas. Think about it. The paper/canvas might be right. Usually, it is. But, just because it is correct doesn’t mean that you can’t overcome it. If everyone gave up when the blank space before them told them they are terrible at creating art and that there is no way they’ll create anything of real worth, then no one would have or will have seen, “Starry Night,” by van Gogh. We would never see Pablo Picasso’s abstract, mind-bending work. Imagine all the world’s best art work. It would not exist. People aren’t scared of blank canvases. They are afraid of what they fill the emptiness within their minds. People fill the spaces with their insecurities, fears, and self-doubt. So, what are you to do when you see that blank page? Take a step back, and instead, turn your gaze to someone you love. Talk to him or her about what makes you vulnerable. Eventually, you’ll be able to see your creative self through the fog that is your self-doubt. You can launch into your creative musings and partial ideas. At this point, it’s time to get it all out. Go to TheMostDangerousWritingApp.com. Once you start writing in the app, you have to continue writing or, within a few seconds, it will delete everything you just wrote. Once you hit five minutes of writing, however, it will not delete what you wrote. When you force yourself to write, you are forcing yourself to create with what comes right off the top of your head. Trust your gut and impulses in these moments. Trust that you are creative, and the magic will flow through you naturally. Feel your creativity burning out? Here’s how to spark your passion again! Celebrating someone’ creativity and supporting their beautiful work becomes annoying, as your jealousy boils beneath the surface. The work that once brought you a passion for life has now become a burden to complete. If you are feeling a creativity burnout, make sure to get at least eight hours of sleep per night; break down large creative projects into exceedingly small, bite-size tasks to help you move through your work one step at a time with low stress; and lean on others who have experienced the same to find comfort and ideas on how to overcome the impending, creative doom you may feel. Some fun news to share with you all this week! When’s the last time you’ve taken a moment to admire the beauty of an arch? Has it really been that long? Arches are ubiquitous they make up so much of our surroundings, but it’s very easy to not notice them—an example of how well they blend into their surroundings. Well, not only are these circular gateways important to the integrity of the buildings that many of us make use of on a day-to-day basis, they can also be quite beautiful. Frieze.com recently gave the arch its proper due in a blog post with some beautiful videos. Frieze London & Pablo Bronstein: The Art of Arches from Frieze Art Fair on Vimeo. For over 25 years Jochen Raiss has been collecting pictures of women in trees. Sound weird? I promise it isn’t. It all started at a Frankfurt market when Raiss stumbled upon a vintage, black and white photo of a woman in a tree. With her dress and dancing shows, she wasn’t exactly dressed for climbing a tree. SInce then, Raiss has found a number of vintage photos of well-dressed women ensconced in trees. Below is an example of one of those photos. 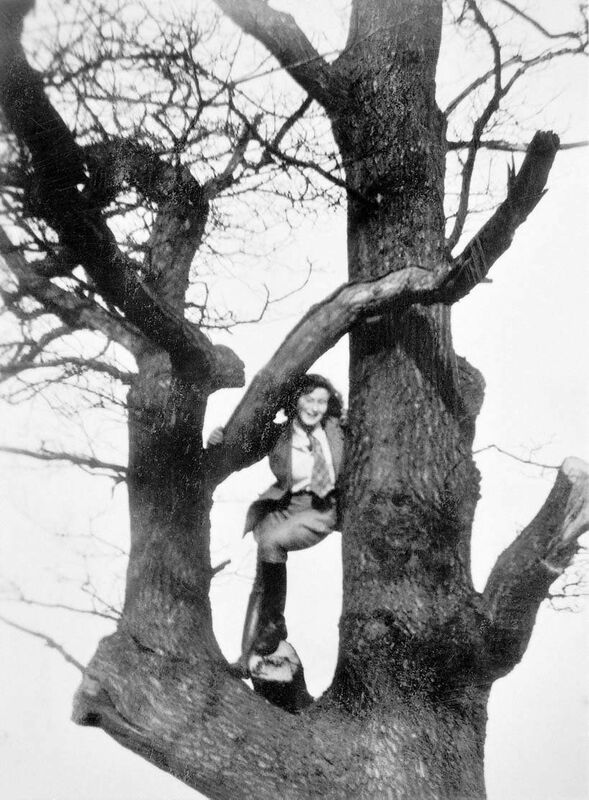 To see the rest, check out “Delightful Vintage Photos Of Women In Trees Are What You Need Right Now” in the Huffington Post. David Lynch is an iconic visionary in the world of cinema. His absurd, jarring, and sometimes downright uncomfortable master pieces like EraserHead, Mulholland Drive, and Blue Velvet have left an indelible mark on the medium. But with all of his high-concept, emotional surgery pieces it leaves one to wonder: what’s it like working with the guy. Chrysta Bell has collaborated with Lynch on a number of projects to bring her music to them. The Wall Street Journal recently had the opportunity to conduct a long interview with Bell that is just as much revealing about her own creative process as it is about Lynch himself. Real Love — Chrysta Bell/David Lynch from LOVE on Vimeo. Those are my highlights from this week. Have you found anything good yourself? Let me know in the comments below! Just published the first part in my Emanations series on Behance. If you’ve been following my blog, you know that I love nature. To be able to hike or go for a walk or generally enjoy the outdoors is essential to my creative process. A lot of my work focuses on nature and nature’s intersection with humanity. I recently released a series that focuses on Flowers around the Vancouver area. I scoured the city for good subjects, looking in gardens, parks, window sills, and of course florists. In this series I really experimented with different media and tools to get a multi-faceted approach to flowers. It’s not just about the angle or the color of a piece, it’s also about the tools you use to tell the story. A no-brainer to some extent, yes, but nonetheless something that I really tried to explore with this series, that I feel I’ve often left to the wayside in other series. I hope you enjoy! Please feel free to tell me what you think by visiting Vimeo and leaving a comment or via Twitter @JuliaSotnykova. Julia Sotnykova Presents: Flowers I from Julia Sotnykova on Vimeo. Julia Sotnykova Presents: Flowers II from Julia Sotnykova on Vimeo. I just created a presentation of some of my work from art school. This body of work comes from my still life painting class, which I found to be a lot more invigorating than I though it would be. If you’ve seen any of my digital design work, you know that I love the intertextuality afforded by the digital medium. You can collage dragonflies wings onto human silhouettes, juxtapose a textureless house next to surreally textured trees, and even emulate the techniques of manual painting. Something I learned to really value in school is just how important it is to master manual techniques before moving on to digital means. I’ve always been big on drawings and sketches, but I did not always have the finesse and attraction to painting that my art school days instilled into me. I’m super stoked for Art Paris Art Fair 2016! I mean, I don’t think I’ll be able to go this year. I want to go this year. But I don’t think I’ll be able to go. Alright, I might be able to go. We’ll see. At Paris Art Fair is basically the comic con of the visual arts world. Artists converge from countries all over the world (roughly 20) to exhibit their work in a number of modern and contemporary art galleries (about 140). Paris may be the historical capital of European art but, Art Paris Art Fair makes a point to lure in and showcase artists from a number of regions, including Singapore, Bangkok, and Casablanca. This year introduces the festivals first artists from Azerbaijan, Colombia, and Iran. will be showcasing some of the top talent from her country of South Korea. All throughout the fair, South Korean art will not only be on display within the main exhibition area, but also throughout the city (2015-2016 marks the France-Korea year). The flavors of art featured at Art Paris is largely post-war and period, and comes in a few different packagings. Solo Show focuses on the work of an individual artist. Promises showcases up-and-coming galleries and artists. ArtDesign explores the dynamic between design and contemporary art with limited-edition pieces. Exhibitions run the spectrum from traditional pictures to full-room pieces that completely immerse you to digital mappings that are projected on the side of the Grand Palais (the HQ for the event). Every year the art world pushes the envelope with new exhibitions. Across the globe there’s plenty of drool-worthy museum shows. In 2015 we saw female artists leading the way headlining massive art shows including Bjork, Marilyn Minter, Yoko Ono and many more. Karara passed away in 2014, leaving behind a massive body of complex conceptual art. This is the first full representation of his output, which spans over 50 years. Art lovers were excited for the continuous live reading of his “One Million Years” series, which consisted of a steady recitation of numbers by volunteers at the ground floor of the Guggenheim rotunda. The influential full-scale retrospective of the Icelandic singer and artist, Bjork, had her entire career of work including sound, film, visuals, instruments, objects, costumes and performance. The show presented her new for 2015 “music and film experience.” This exhibition was a must see for all Bjork fans. The currently running (until November 1st) exhibition, is a collection of Koahlo’s paintings and works on paper that mine her relationship with the natural world of in Mexico. The show also features a flower show that re-imagines Kahlo’s studio and garden at the Casa Azul in Coyoacan, Mexico City. Currently running into 2016, featuring the works of Fritz Scholder. Scholders paintings have been called many things, like controversial, revolutionary and haunting. Scholder claimed he was “not an American Indian artist”, but he was. He claimed his art wasn’t political, but it polarized the art world. Just wrapping up last month, this was the MoMA’s first exhibition dedicated exclusively to the works of Yoko Ono. The last time she’s had work at MoMA was in 1971, and this show differed by being a bit more extensive. Featuring 125 early objects, works on paper, installations, performances, audio recordings and films that celebrated her career.